She lasted until around when Chris Bosh went at No. 4 before she bailed to the other room and turned on some reality show with Lamar Odom and whichever Kardashian he married. Honestly, I couldnÃ¢â‚¬â„¢t really blame her, but thereÃ¢â‚¬â„¢s just something about the NBA Draft IÃ¢â‚¬â„¢ve always loved, dating way back to high school. For starters, basketball has hands-down the best draft of any of the major sports. I like the NFL Draft in theory, but itÃ¢â‚¬â„¢s basically a headache-inducing three-day test of endurance. BaseballÃ¢â‚¬â„¢s draft has made strides in visibility, watchability and production value. But it too takes forever, and itÃ¢â‚¬â„¢s tough to get past the fact that you donÃ¢â‚¬â„¢t know many players and wonÃ¢â‚¬â„¢t actually see them for a few years. The NBA Draft has none of these drawbacks. ItÃ¢â‚¬â„¢s relatively concise at two rounds, and IÃ¢â‚¬â„¢ve watched the majority of the draftees in college and have often seen them play live in high school. Plus, even if I donÃ¢â‚¬â„¢t really know the foreign guys that well, thereÃ¢â‚¬â„¢s a pretty good chance for unintentional comedy, as with SportsAngle favorite Jan Vesely. 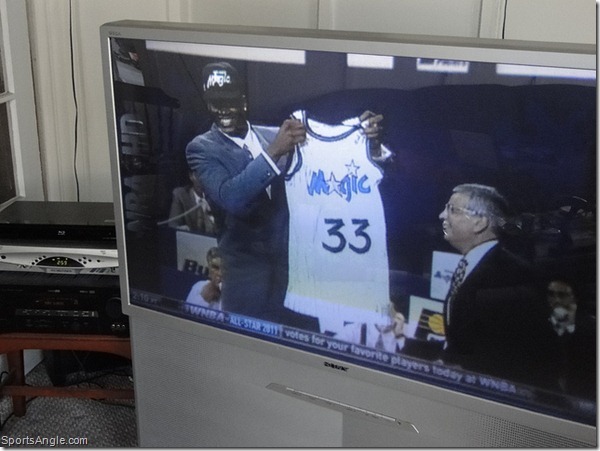 Back in June, NBA TV ran all the televised drafts in sequence leading up to the 2011 edition, and I recorded several that I had history with, or that I simply wanted to use to hop in a time machine. In particular, the 1992 Draft piqued my interest, especially with the recent retirement of Shaquille OÃ¢â‚¬â„¢Neal fresh in my mind. I meant to watch it in June when I recorded it, but I got caught up in the MLB All-Star Game and then careened right into the Trade Deadline. With all that over, no NBA season in sight and college hoops a few months away, I found myself in need of a basketball fix. Work constraints have kept me from finding Kevin Durant to watch him drop 60 on a bunch of random dudes, so I finally hit play on the Ã¢â‚¬â„¢92 Draft. Whenever you open a time capsule from two decades ago, it calls your attention to how different things are now. The analysts Ã¢â‚¬â€œ Doug Collins and a relatively youthful Hubie Brown Ã¢â‚¬â€œ donÃ¢â‚¬â„¢t bluster nearly as much, and it looks like the NBA was more focused on function than production value. The Draft stage looks more like the Lottery; David SternÃ¢â‚¬â„¢s podium is backdropped by team executives all in a row, all on the phone. There was little suspense for the first pick, as Shaq was a no-brainer Ã¢â‚¬â€œ he was enormous, and heÃ¢â‚¬â„¢d averaged 24.1 points, 14 rebounds and 5.2 blocks as a junior at LSU. But your heart still speeds up a bit when they throw it to Stern at the podium. Or at least, mine does. Yet as now, the proceedings are decidedly ordinary. Even someone as colorful as Shaq Ã¢â‚¬â€œ he had already begun giving himself nicknames at LSU Ã¢â‚¬â€œ went through the same old motions. Put on the cap, pose with Stern, give a relatively mundane interview with a relatively demurely attired Craig Sager. Move on to Alonzo Mourning at No. 2. There were a couple nice touches, though; for the sake of visuals, I think they should bring back players holding up jerseys on the podium like Shaq did with No. 33, soon to be No. 32. And the music they played without irony when the players came to the podium was campy and fantastic. Tom Gugliotta and Doug Christie Ã¢â‚¬â€œ not Shaq Ã¢â‚¬â€œ were drafted to the Superman theme song. Tracy Murray was the undeserving recipient of the Rocky theme. Shaq entered to Chariots of Fire, Zo to Ric FlairÃ¢â‚¬â„¢s theme music, Jim Jackson to the BullsÃ¢â‚¬â„¢ introduction song. ItÃ¢â‚¬â„¢s like they just got some corny movie soundtrack CD and put it on shuffle. Compared to Ã¢â‚¬Ëœ92, the presentation of the modern-day Draft is a bit too slick, too safe, too Stuart Scott. Looking back, the 1992 Draft was a watershed moment for me in terms of becoming a basketball fan, despite the fact that I didnÃ¢â‚¬â„¢t even actually watch the Draft. Prior to that, I was a straight-up baseball acolyte who only casually kept up with the absolute crÃƒÂ¨me de la crÃƒÂ¨me, the Jordans, Magics and Birds. I got really into the NBA the following autumn, when my friends hooked me on Draft pick cards from a popular brand at the time, Ã¢â‚¬Å“Classic.Ã¢â‚¬Â I was assured by more clued-in classmates that Shaquille OÃ¢â‚¬â„¢Neal was the next big thing, and lo and behold, they were right Ã¢â‚¬â€œ though who knew how many others they said that about? Derrick Coleman, probably? Glenn Robinson? That Classic set was upside personified. Every card was a rookie card, technically, and they were all treated as growth stocks. 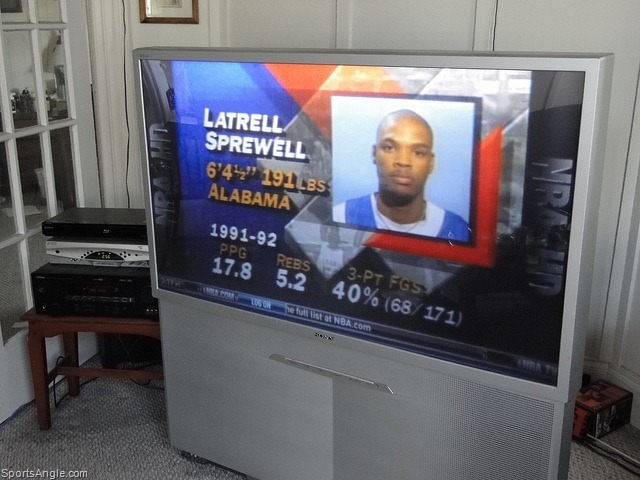 Latrell Sprewell, Todd Day, Bryant Stith, same difference. I vividly remember working out a transaction with an enterprising friend that culminated in my dad taking me to his house to purchase an Anthony Peeler card for a dollar. IÃ¢â‚¬â„¢d say we spent more on gas driving over there, except gas was a lot cheaper back then. 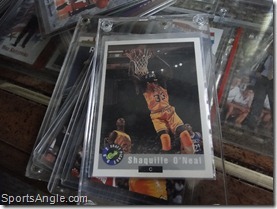 To open a pack and see ShaqÃ¢â‚¬â„¢s grinning face staring back at you was akin to finding a Willy Wonka golden ticket. 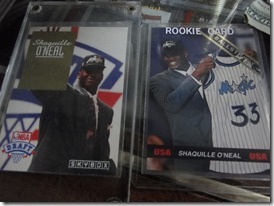 Upper Deck even had a card youÃ¢â‚¬â„¢d mail in to them, and theyÃ¢â‚¬â„¢d mail you back a Shaq card, since they couldnÃ¢â‚¬â„¢t beat the deadline to get the No. 1 pick in their 1992-93 set. High-concept stuff. 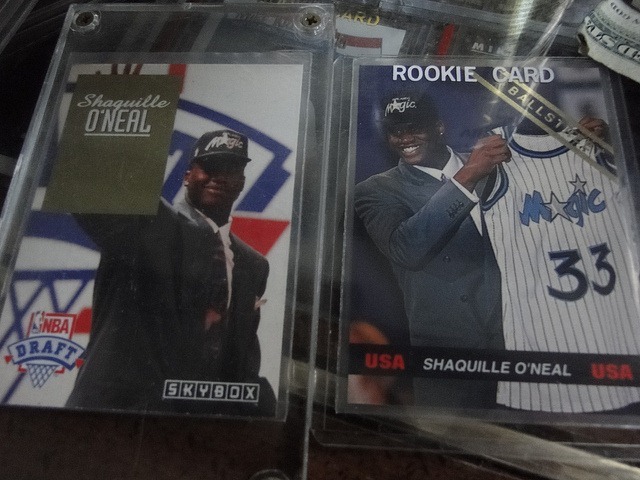 Like everyone else, I dug Shaq back then. Shaq was huge, he was fun, he rapped, he destroyed backboards. As a Knicks fan, I habitually and futilely rooted against Jordan, and Shaq was the one credible alternative from a basketball and marketing standpoint. A Champion replica Shaq jersey was a status symbol in my eighth grade class, as were those glorious first-edition Reeboks. That said, with so much hype, the luster wore off quickly. Just a year later, when I went to buy my first-ever basketball jersey, I considered ShaqÃ¢â‚¬Â¦ and then opted for Penny Hardaway, since almost nobody had one of those. Shaq was gradually eclipsed over the next few years by cooler, more dynamic players like Chris Webber, Grant Hill and Allen Iverson. Everyone respected Shaq, but we didnÃ¢â‚¬â„¢t really check for him anymore. In a similar vein, by the end, I feel that Shaquille ended up so overrated, he was underrated. When he retired, I actually had people try to tell me that Shaq was great, but could have been far better if he had worked on his game more extensively, as if that could be quantified. 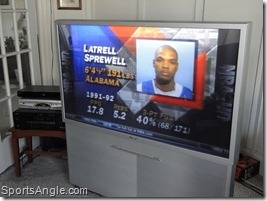 Meanwhile, he was second all-time in field goal percentage, seventh in scoring and third in efficiency rating. He won three titles with the Lakers, then evolved perfectly to win a fourth with the Heat. Plain and simple, heÃ¢â‚¬â„¢s one of the greatest and most dominant players ever. But to me, his greatest accomplishment was capturing the imagination of an entire young generation, defining an era. Sometimes the anticipation of something significant is far sweeter than what we actually end up getting, even if it pretty much meets expectations. And far more memorable to me than a dominant Shaq winning championships in his prime was that first watershed year, when my friends and I debated Shaq vs. Jordan over school lunches before playing touch football and NBA Jam while eating Doritos. ThereÃ¢â‚¬â„¢s something to be said for a time when anything is possible and the sky is the limit.